TONY: (Picks up ringing phone) TT, here. Talk to me. TONY: I’m sitting down. I’m in the office. I just got back from biking, surfing, playing soccer, and talking about the importance of breakfast with a couple of neighborhood kids. ELLA: You’re right. You’re absolutely right. Anyway, the day I told you would come is finally here. Remember when we renegotiated your contract, and I made Kellogg’s pay one dollar for the naming rights to be The Official Cereal of Tony the Tiger? Well, somebody else wants in. ELLA: Not just another cereal – another company entirely. Honeycombs is interested, and they’re talking big bucks. Those words: The official cereal of Tony the Tiger changed everything. They want to be official with you, Tony. TONY: Post? Kraft Foods? This is big, Ella. This is huge. 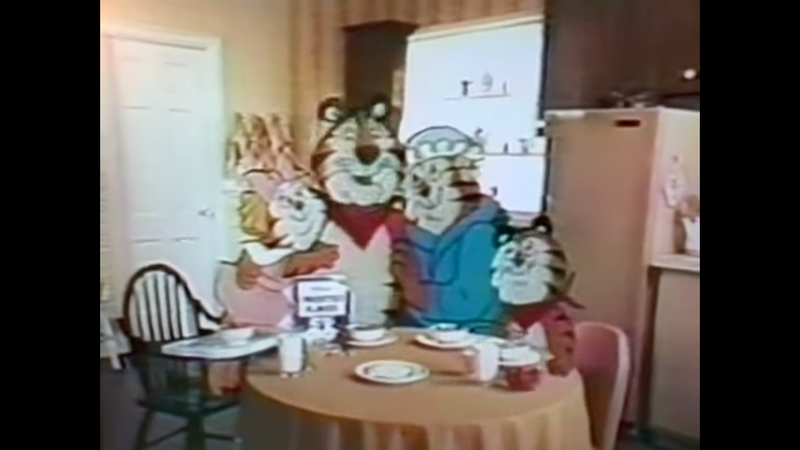 I mean, this would be a grrrrreat betrayal to the whole Kellogg’s family. TONY: When Mrs. Tony and the kids left, I decided to fill my days with weight lifting, action sports, and breakfast cereal. I don’t look back. Everything happens for a reason. ELLA: And this is happening for a reason, and it’s because you’re the best mascot on the cover of any cereal, bar none. This is the plan, baby. Everything we’ve ever dreamed about is coming to pass right now. TONY: I need to think about this, Ella. Honeycombs don’t have the best track record here. You had the Honeycomb Kids and the Honeycomb Hideout, which I could’ve told you wouldn’t become a thing. There were was Crazy Craving, who was Gritty before Twitter existed to foster an ironic appreciation of him. “Me want Honeycomb?” Get outta here. These are kids we’re talking to, not idiots. Then Bernard the Bee Boy?! TELL ME HOW THAT WOULD EVEN WORK, ELLA! HOW? How would this even work, Ella? ELLA: That’s why they want you, Tony. You’re bigger than cereal. Or you could be. You make this move, and you become bigger than cereal. ELLA: It takes a big tiger to admit to being afraid, Tony. I can give you two precedents. Hulk Hogan jumping from WWF to WCW, sending shockwaves through the industry. He pushed WCW to the top. Um… The Verizon guy jumping to Sprint. This may not be the best example, since we still call him the Verizon guy. TONY: I could be Hulk Hogan or the Verizon Guy. ELLA: Imagine showing up on Honeycombs wearing Hollywood Hogan’s feather boa. TONY: They would never let me, but I’ve always wanted to wear boas. ELLA: If you want to wear boas, we’ll get you boas. We’ll stipulate it in the contract. Tiger-striped boas. TONY: We’re getting off track, here. TONY: We don’t mention the steroids thing, Ella. ELLA: You’re right. I’m just saying – let’s get this bread, Tony. Let’s get this bread for you, Tony Jr. , Anotinette, Mrs. Tony, Mama Tony, rest in peace, and every other mascot who feels trapped on the cereal box they’re on. Screw Kellogg’s. Let them get the Exxon Tiger and see how well he’s able to sell cereal. They’ll come crawling to us, and that’s when we can really make moves. ELLA: Let’s show them who’s the boss. Tony hangs up the phone and takes a look around his massive Frosted Flakes-decked out office. There’s memorabilia everywhere, including one corner of the office that has every child he’s ever worked with locked up in a tiger cage. Tony: (to the kids) It looks like this is about to become the honeycomb hideout!